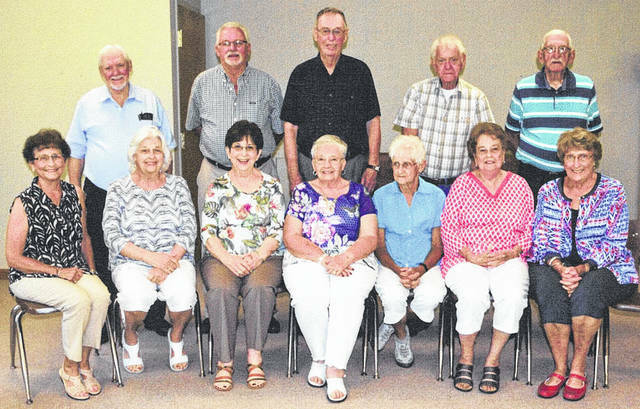 The Simon Kenton High School class of 1957 met Aug. 25 near Lees Creek at the Community Christian Church’s social room for its 61st high school graduation reunion. Classmates and their spouses enjoyed a delicious buffet luncheon catered by Sams Meats and Deli and spent the afternoon reminiscing and visiting with each other. They plan to meet again next summer. Simon Kenton High School is now East Clinton High School. Shown from left, seated in the front row, are Junia Mescher Bond, Mary Ann McFadden Moore, Shirley Ann McFadden Webb, Nancy Jandes Knapp, Bonnie Roberts Smith, Jane Babb Warehime and Mary Alice Hartman Thatcher. Standing in the back row, left to right, are Joseph Pinkerton, Charles Pitzer, Earl Murphy, Richard Davis and Dorsey Wilson.